In the 46 years since its founding, the Community Child Care Council of Santa Clara County has gone from managing shoestring budget to, at its peak, $47 million a year in public funds for subsidized day care. Now, it’s poised to lose everything after a damning audit shed light on rampant abuses, including, among other things, misuse of taxpayer money, falsified and missing records and a seven-figure pension account that appears to benefit only one person: former executive director Alfredo Villaseñor. The just–released legislative audit also put regulators at the California Department of Education (CDE) on blast for failing to detect any of the violations at the nonprofit known as 4Cs, which showed reckless disregard for the terms of its grant agreements. 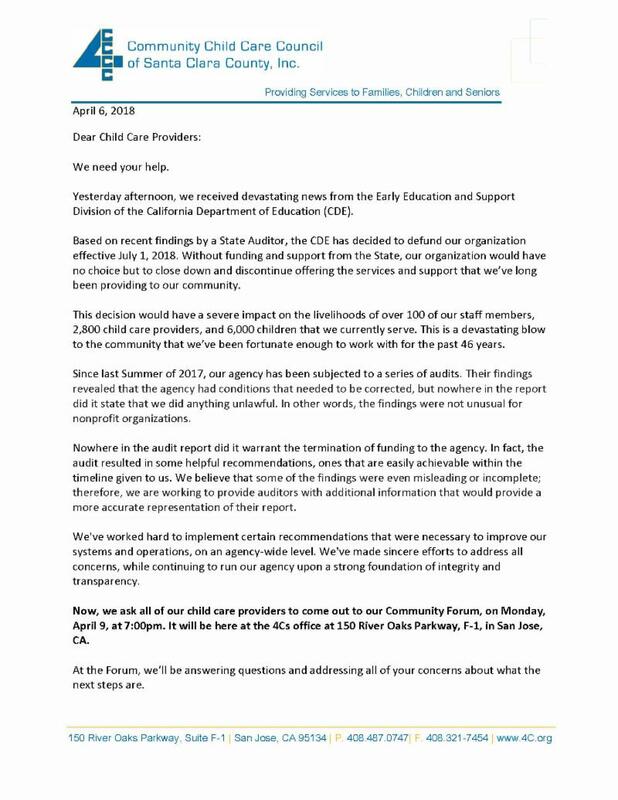 On Friday, a CDE administrator named Lisa Velarde sent 4Cs interim director Joe Manarang a letter informing him that the nonprofit, which reportedly serves 6,000 children, would lose funding by July 1, and that he had 10 days to contest the decision. Velarde said the CDE made its decision because of the legislative report, which found that 4Cs failed to justify 81 percent of administrative costs reviewed by auditors, robbed needy parents of time to re-apply for child care by backdating eligibility forms and placed undue financial hardship on day care providers by falling weeks behind on their paychecks. Some of 4Cs’ practices, namely the backdating, “could constitute egregious instances of fraud,” Velarde cautioned. Instead of telling stakeholders the truth, Manarang—presumably at the urging of 4Cs’ ethically challenged board president Ben Menor—denied the state’s allegations of wrongdoing and tried to make everyone scared enough to support 4Cs’ appeal. In an unsigned email riddled with exclamation points and random capitalization, 4Cs management professed innocence—“nowhere in the report did it state that we did anything unlawful,” they fibbed. Although that same day, oddly enough, someone on staff felt the need to tape up reminders in the employee toilet stalls reminding everyone to pay child care providers on time. Sources say about 100 of them showed up to the gathering while Menor and a hired guard stood outside to keep union reps from handing out leaflets that described the organization’s shady conduct. Contrary to what Menor and his buddy Manarang claim, it’s upper management jobs that are on the line. The imminent defunding simply means that the CDE will dispense with 4Cs and find a new middleman to administer $40 million or so in grants that, for the most part, will go to the same independent day care contractors. The CDE’s recent crackdown comes as 4Cs’ federal grant givers take a hard look at the $3 million or so it entrusts to the nonprofit each year for Early Head Start programs. If 4Cs loses that money, too, it would zero out the entire budget. On another note, why does the media keep showing photos of 4-5 SEIU purple t-shirters yelling and screaming jibberish at every event? I mean really, don’t these folks have day jobs? Service workers often have night and afternoon shifts, so that those of us fortunate enough to have “day” jobs can shop, check into hotels, etc. at our convenience. So what are they screaming about? They have a union job right? Yep, most of us work all hours in the Valley. So nice to see y’all have enough time and energy to abandon your family needs after hours to get a purple shirt and walk in circles yelling gibberish. Alfred Villasenor rides off into retirement with a 7-figure pension courtesy of the taxpayers. Ben Menor and Joe Manarang are defrauding the government and the residents of this county while they cheat the child care providers in their system. All three of them should be stripped of their positions, their pensions and banned from ever working in the public sector again. Absolutely shameful. Who are your sources for this article? Just the union? That would explain why there are so many inaccuracies written here. You guys really need to check your facts thoroughly before you hit publish. The main sources, which are already cited in the article above, include public records from the CDE, emails from 4Cs, the state legislative audit and documents obtained through various agencies via formal CPRA requests. Alfredo Villasenor, Ben Menor’s and your unconditional concealers, THE HEN OF THE GOLDEN EGGS is over!! !